Our Credit Union Trends Report for July 2018 is now available online. The report covers data from May 2018 and includes details on credit union memberships, loans, savings and more. During May, credit unions picked up 475,000 in new memberships, and loan and savings balances grew at a 9.9 percent and 5.7 percent seasonally-adjusted annualized pace, respectively. Firms hired 244,000 workers, nominal consumer spending increased 0.2 percent, and long-term interest rates rose 0.11 percentage points. Consumers are feeling confident about their future financial conditions and will keep the economy moving forward through 2019. At the end of May, CUNA’s monthly estimates reported 5,722 credit unions in operation, two fewer than one month earlier. Year-over-year, the number of credit unions declined by 231, greater than the 180 lost in the 12 months ending in May 2017. Total credit union assets rose 0.3 percent in May, better than the 0.1 percent decline reported in May of 2017. Assets rose 5.4 percent during the past year due to a 5.7 percent increase in deposits, a 2.1 percent increase in borrowings and a 5.7 percent increase in capital. The nation’s credit unions increased their loan portfolios by 1.3 percent in May, slightly above the pace reported in May 2017. Loan balances are up 9.9 percent during the last 12 months. 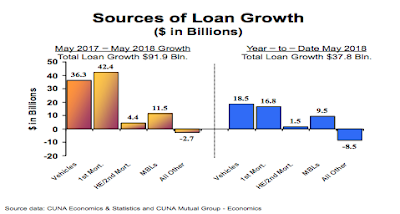 With loan balances growing faster than savings, credit union liquidity is tightening up as the credit union average loan-to-savings ratio reached 83.4 percent, up from 80.2 percent in May 2017.
Credit union memberships rose 0.41 percent in May, above the 0.36 percent gain reported in May 2017. Memberships are up 4.7 percent during the past year due to robust demand for credit, solid job growth and credit unions having comparatively lower fees and loan interest rates. Credit union loan delinquency came in at 0.64 percent in May, below the 0.74 percent reported in May 2017, and below the natural delinquency rate of 0.75 percent. Delinquency rates typically reach their lowest point in the 2nd quarter of a year, so expect the ratio to begin rising in the second half of 2017. To access the full report, go to cunamutual.com.